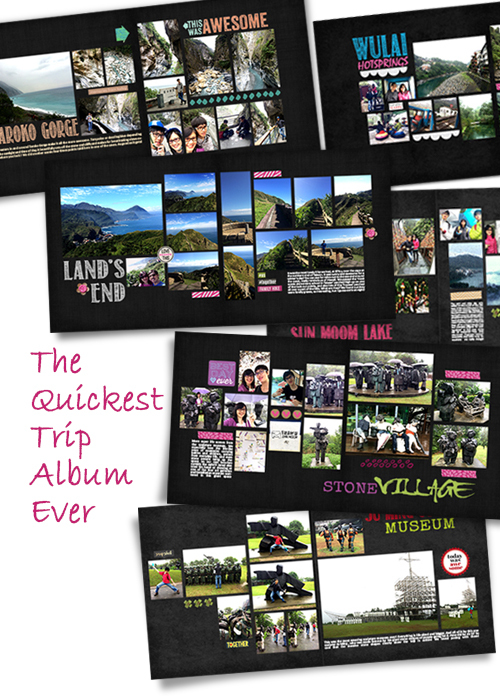 simply yin: The quickest trip album ever! The quickest trip album ever! 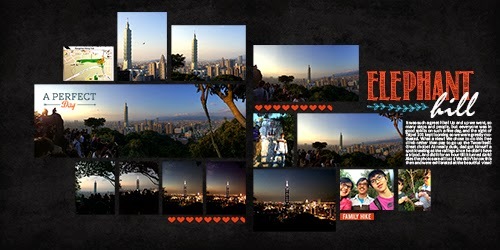 Last week I shared how my husband lost all his beautiful photos of our Taiwan trip when he lost his camera. And how my layouts on the Project Life app saved our memories. 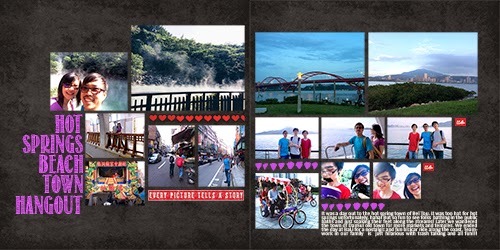 I still wanted a Taiwan photo book, but since I have less photos then usual, I wanted to do this differently. And quickly. This is how. 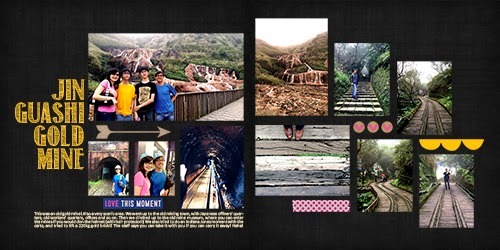 First I decided to make these pages in the linear collage style like last year's Bali album. I will save a lot of time from not making the mats and shadow for each individual photo. 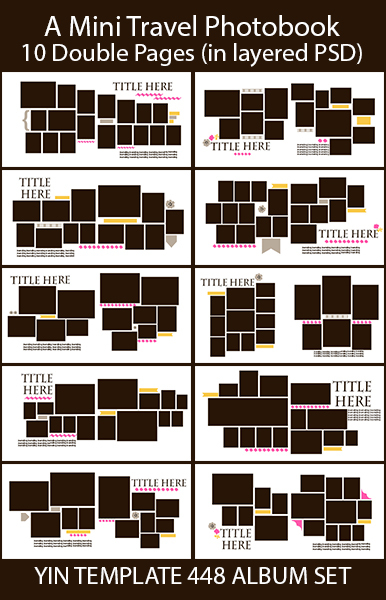 The most important time-saver is the Pre-selection of papers and elements to be used on all the layouts, and sticking to them! 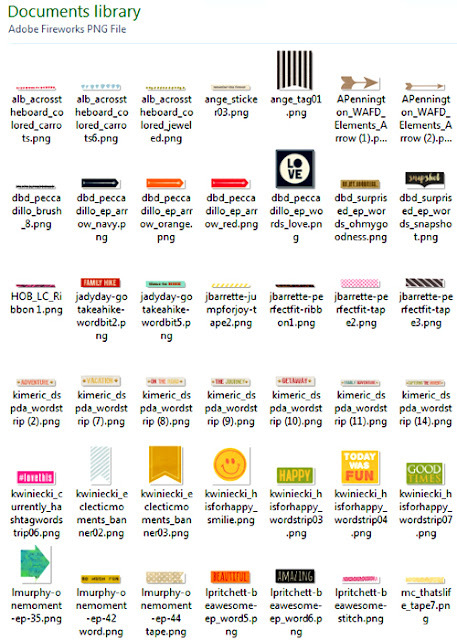 I also decided not to use alpha for the titles, which saved me 30 rounds of alpha-search, so there! 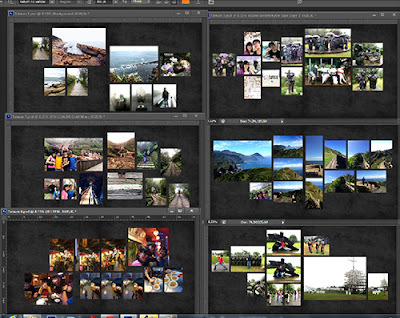 Select the photos for all the layouts all at one go. 30 photoshop files were opened to house the photos sorted by days or places we visited. Pre-Select the background papers ( only 2 black papers) and about 100 elements (word strips, tape) based on the few main colors I can see in the photos and save them to a special folder. 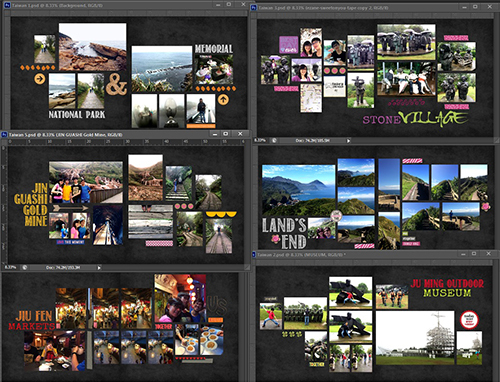 These were reused and repeated through the layouts and saved time and provided a consistent theme to the album. Color process all the photos at one go - brightening or sharpening using the levels tool only. 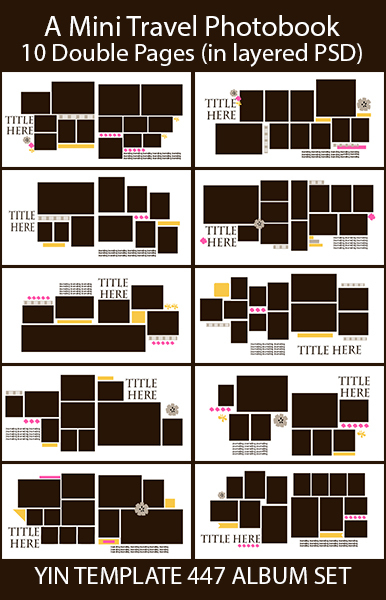 And here are the accompanying templates - currently 20% off in the store. Thanks for looking! 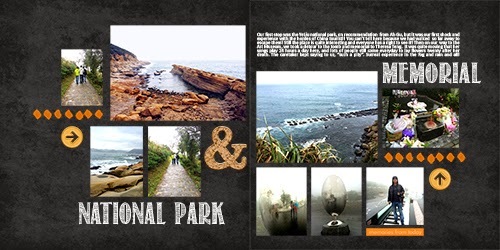 Journaling reads: Our first stop was the YeLiu national park, it was our first shock and experience with the hordes of China tourist!! You can’t tell here because we had walked so far away to escape them! Still the place is quite interesting and everyone has a right to see it! Then on our way to the Sculpture Museum, we took a detour to the tomb and memorial to Theresa Teng. It was quite moving that her songs play 24 hours a day here, and lots of people still come everyday to lay flowers twenty years after her death. The caretaker kept saying to us, “such a pity”. Surreal experience in the fog and rain and all! 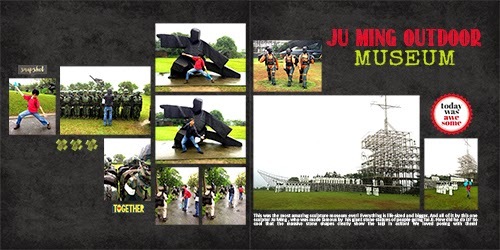 Journaling reads: This was the most amazing sculpture museum ever! Everything is life-sized and bigger. And all of it by this one sculptor Ju Ming , who was made famous by his giant stone statues of people doing Tai Ji. How did he do it? So cool that the massive stone shapes look like a TaiJi master in action! We loved posing with them! 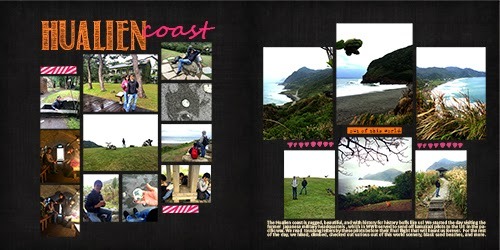 It was the most lovely hike we had, at BiTou, near the cape at the northern end of Taiwan. It was sunny and awesome for a winter’s day! You can see for miles out to the sea and around the coast, really reminds us of Hawaii. We passed the ‘most scenic elementary school in Taiwan’ perched high up on one of the look out points, and also lots of tiny ‘houses’ perched all over a part of the hills. What are they? We found out they were family graves, so interesting, but I guess eerie at night! More of the fantastic and dramatic coast on the fine day where we drove, stopped, hiked, took it in! This was an old gold mine! Also a very scenic area. We went up to the old mining town, with Japanese offivers’ quarters, old workers’ quarters, offices and so on. Then we climbed up to the old mine museum, where you can enter the mines if you would don the helmet (with hair protector!) We also tried to do an Indiana Jones moment with the carts, and tried to lift a 220kg gold brick!! The staff says you can take it with you if you can carry it away! Haha! 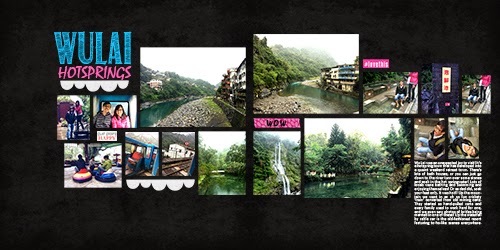 Jiu Fen is a must-visit for everyone! An atmospheric bustling market street. 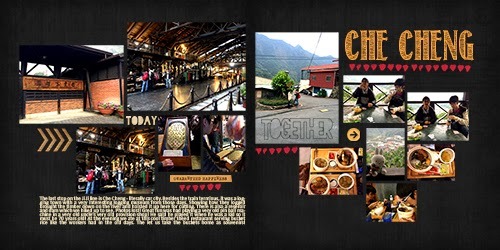 Full of all sorts of delicacies, dessert, foodstuff, souvenirs, though touristy, but still a wonderful taste and see it all and soak it in kind of place! Dad bought grape concentrate(! ), we tried peanut ice cream popiah (yummy! ), the boys even ventured to speak mandarin and bought lots of crackers and the like on their own. We crashed in a cafe for some grilled cuttlefish and taidi. 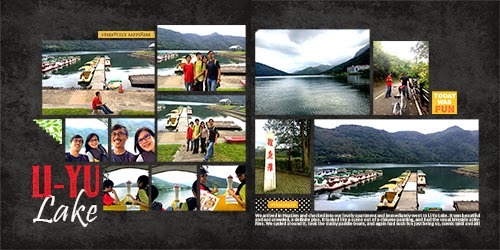 Missed the beautiful scenery due to the rain, will definitely come back if we are in Taiwan again. It was a day out to the hot spring town of Bei Tou. It was too hot for hot springs unfortunately, haha! But so fun to see folks bathing in the public baths and just soaking their feet along the streams! Later we wandered the town of DanShui old town for more markets and temples. We ended the day at BaLi for a nostalgic and fun bicicar ride along the coast. Teamwork in our family is just hilarious with trash talking and all fun!!! 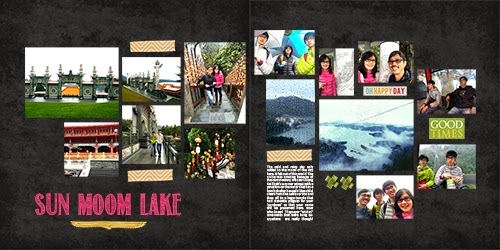 We arrived in HuaLien and checked into our lovely apartment and immediately went to Li-Yu Lake. It was beautiful and not crowded, a definite plus. It looked like a scene out of a chinese painting, and had the usual lakeside activities. We cycled around it, took the ducky paddle boats, and again had such fun just being us, scenic taidi and all! 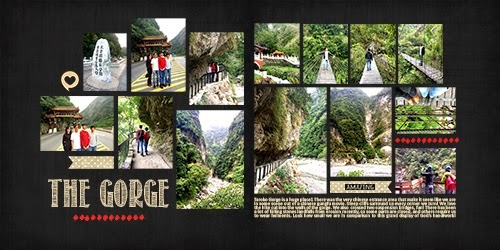 Taroko Gorge is a huge place! There was the very chinese entrance area that make it seem like we are in some scene out of a chinese gungfu movie. Steep cliffs surround us every corner we turn! We love the hike cut into the walls of the gorge. We also crossed two suspension bridges, fun! There has been a lot of falling stones landfalls from erosion recently, so some parts are closed, and others require us to wear helments. Look how small we are in comparison to this grand display of God’s handiwork! 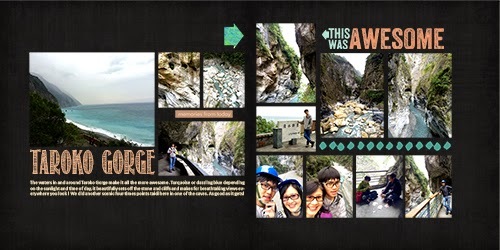 The waters in and around Taroko Gorge make it all the more awesome. Turquoise or dazzling blue depending on the sunlight and time of day, it beautifully sets off the stone and cliffs and makes for breathtaking views everywhere you look ! We did another scenic four-times points taidi here in one of the caves. As good as it gets! 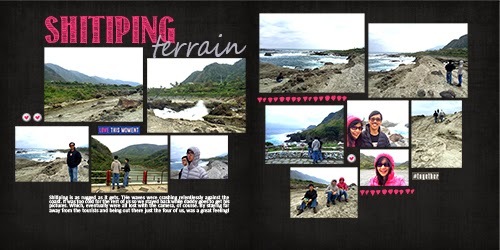 The Hualien coast is rugged, beautiful, and with history for history buffs like us! We started the day visiting the former japanese military headquarters , which in WWII served to send off kamakazi pilots to the US in the pacific war. We read touching letters by these pilots before their final flight that will haunt us forever. 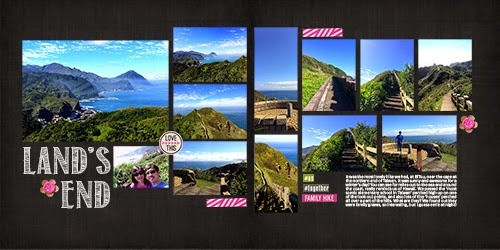 For the rest of the day, we hiked, climbed, checked out various out of this world scenery, black sand beaches, and more. Shitiping is as rugged as it gets. The waves were crashing relentlessly against the coast. It was too cold for the rest of us so we stayed back while daddy goes to get his pictures. Which, eventually were all lost with the camera, of course. By staying far away from the tourists and being out there just the four of us, was a great feeling! 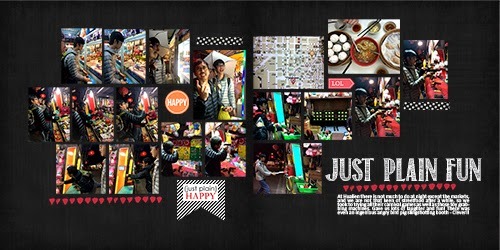 At Hualien there is not much to do at night except the markets, and we are not that keen for streetfood after a while, so we took to trying all their carnival games as well as those toy grabbing machines. Gave us lots of laughter and fun! There was even an ingenious angry bird pig slingshotting booth - Clever!! This was probably the most impactful day in our trip. No matter how much we had read beforehand, we were in shock the moment the crumbled buildings came into sight amongst the residential houses. 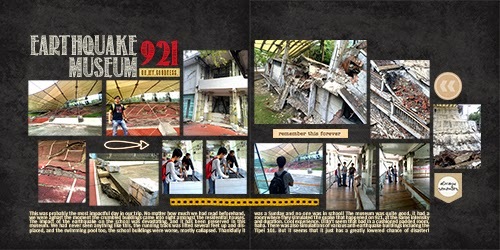 The impact of the earthquake on the school was devastating, and it has been preserved in this museum. We had never seen anything like this, the running track was lifted several feet up and displaced, and the swimming pool too, the school buildings were worse, mostly collapsed. Thankfully it was a Sunday and no one was in school! The museum was quite good, it had a room where they simulated the quake that happened on 921, at the same intensity and duration. Cool experience. Didn’t seem that bad in a cushioned padded room, haha. There was also simulations of various anti-earthquake buildings includng the Taipei 101. But it seems that it just has a greatly lowered chance of disaster! The cold and rainy day only added to the mood of the day here. It felt out of this world. The cruise was amusing because of the commentary, we saw Chiang Kei Shek’s summer retreat with a pavaillon on the water that has a bomb shelter beneath! Beautiful views from the cable car too and then off to a huge temple that had statuette plagues for your ‘purchase’ so that your name will be preserved here. wow who knew! The Prayer “wishes” ornaments that were hung everywhere are really though! Lu Kang is surprisingly fun. 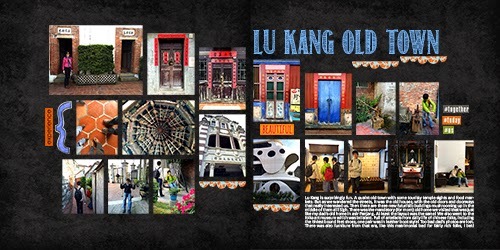 A quaint old town with some touristy temple sights and food markets. But as we wandered the streets, it was the old houses, with the old doors and doorways that really interested us. Then there are these new futuristic buildings mushrooming up in the middle of them all! Sigh. There was the mandatory (for mom) old home we visited that was just like my dad’s old home in Pasir Panjang. At least the layout was the same! We also went to the folks art museum which was brilaiant. Full of artefacts from daily life of chinese folks, including the tiniest bound feet shoes, one pair was in leather boot style! Too bad dad’s photos are lost. There was also furniture from that era, like this matrimonial bed for fairly rich folks, I bet! It was such a great hike! Up and up we went, so many steps and people,but everyone was in good spirits on such a fine day, and the sight of Taipei 101 kept looming so we were greatly motivated. What a view! We chose to do this free climb rather than pay to go up the tower itself. Great choice! At nearly dusk, dad got himself a spot kneeling at the railings since he didn’t have a tripod. And did it to take pictures for an hour till it turned dark! 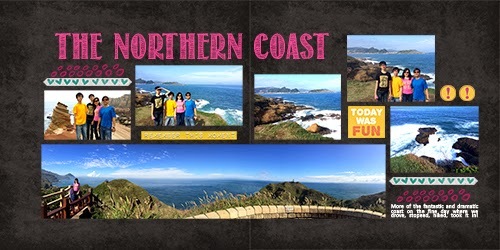 Alas the photos are all lost :( We didn’t know this then and were exhilarated at the beautiful view! The last stop on the Ji Ji line is Che Cheng - literally car city. Besides the train terminus, it was a logging town with a very interesting logging museum from those days. Showing how they logged brought the timber down on the river and hoisted it up here for cutting. There is also a reseroir and dam which we hiked up to see. Photos lost! Great fun was had playing a very old pin ball machine in a very old uncle’s very old provision shop! He said he played it when he was a kid so it must be 70 years old! 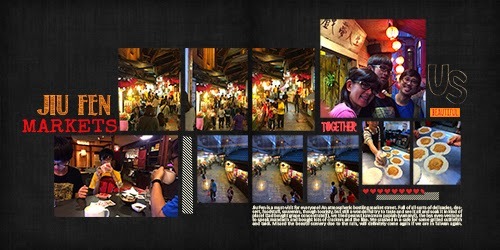 At the evening we ate at this cool timber themed restaurant serving bucket rice like the workers had in the old days. They let us take the buckets home as souvenirs! 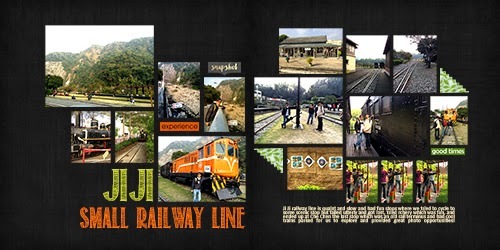 Ji Ji raliway line is quaint and slow and had fun stops where we tried to cycle to some scenic stop but failed utterly and got lost, tried archery which was fun, and ended up at Che Chen the last stop which was an old rail terminus and had cool trains parked for us to explore and provided great photo opportunities! Wu Lai was an unexpected joy to visit! 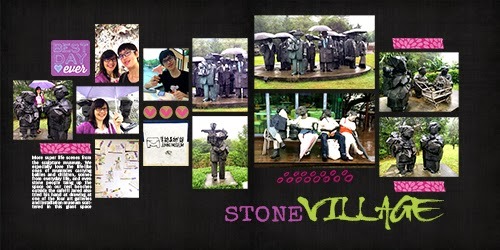 It’s a hotspring town that has developed into a quaint weekend retreat town. There’s lots of bath houses, or you can just go down to the river turn over some stones and soak in the hot springwater! Lots of locals were bathing and swimming and enjoying themselves! Or as dad did, soak your feet only. It was hot!! Up the mountain we went in an oh so fun crickety ‘train’ converted from old mining carts. They started as hand-pulled carts and every family used to work hard for one, and we even saw photos of brides being married in one of these! Up the waterfall by cable car is the old-fashioned resort featuring to-ho-like scenes everywhere. 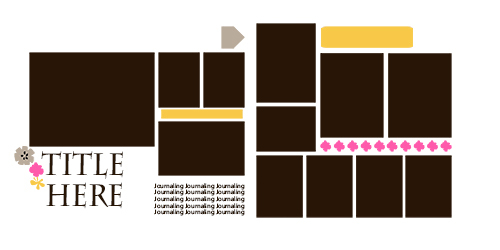 And for your playing pleasure, here is a template based on one of the layouts. Enjoy! Your album looks awesome! I love your layout style, the photos always pop on the pages and the elements complement the layout, instead of taking over the page, beautiful! Oh Daniela, thank you! That is how I hoped the pages will be! 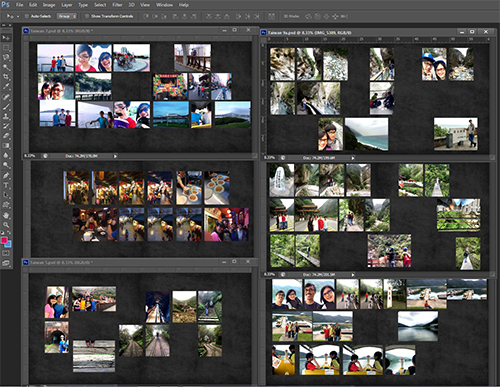 I am so glad you were able to save some memories of your trip with these photos. Love the pages you created! Thanks! Sure - the fonts are: For Village: VNI-HLThuphap, Markets & Museum: Special Elite, Lake: Pristina, Coast & Terrain: Segoe Script. Have fun playing and creating!